Motorcycle enthusiasts everywhere know that the keys to a great road trip are scenic views, eclectic roadside attractions and, most of all, a comfortable bed at the end of the day! 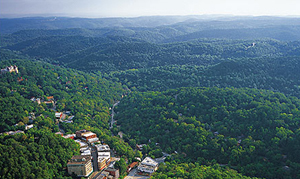 Eureka Springs, Arkansas offers all of this and much more. 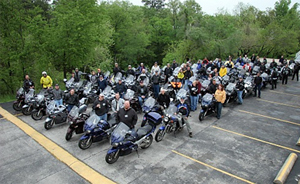 Eureka Springs, a town listed by the National Trust for Historic Preservation, draws motorcycle enthusiasts from all of the country to come explore its winding roads, laid back atmosphere, unusual shops, bars and eateries. An hour east of the Bentonville to Fayetteville corridor, and with Branson only 65 miles away, Eureka Springs is the perfect spot from which to truly explore the beautiful Ozark Mountains. Roaring River State Park for a unique experience to see a trout hatchery and an underground river. And of course all things Eureka Springs. A Pool - Cool off in a refreshing pool and enjoy Eureka Springs under the stars. A Hot Tub - Soothe sore muscles and relax with friends around the hot tub. A Place Close to Downtown – Off of Hwy. 62 at the entrance to historic downtown Eureka Springs; its where all the fun happens in the evenings. Secure Parking - if possible, park right in front of your room. It doesn’t get more secure than that! A Motorcycle Wash Station - A wash station complete with wipe towels makes getting ready for another day of riding quick and convenient. Level Parking - safe and easy parking for your bike! Complimentary Breakfast - this is a no brainer. Fuel up before you take off. Breakfast served onsite is convenient making it easy to get back on the road for another day of exploration.